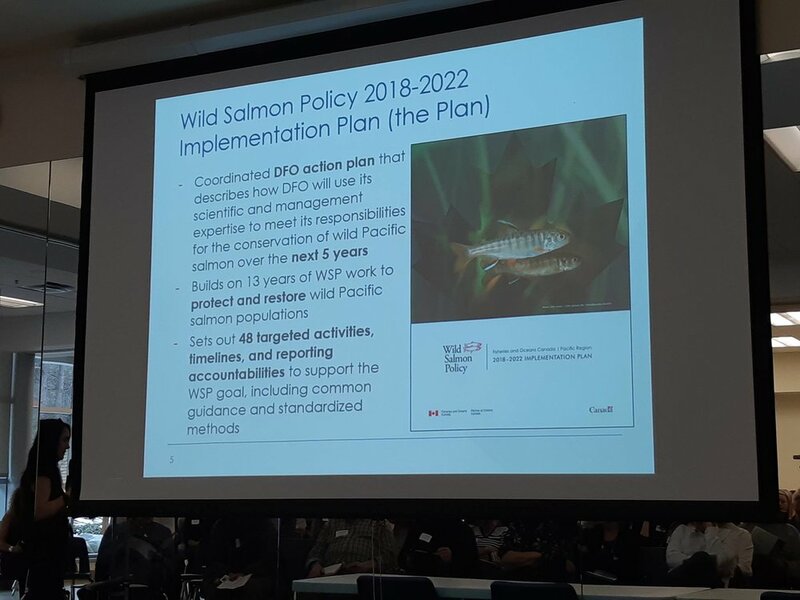 The Wild Salmon Policy: Canada’s Policy for Conservation of Wild Pacific Salmon guides Canada and its partners in protection and conservation actions for the 5 iconic wild Pacific salmon species and their habitats. 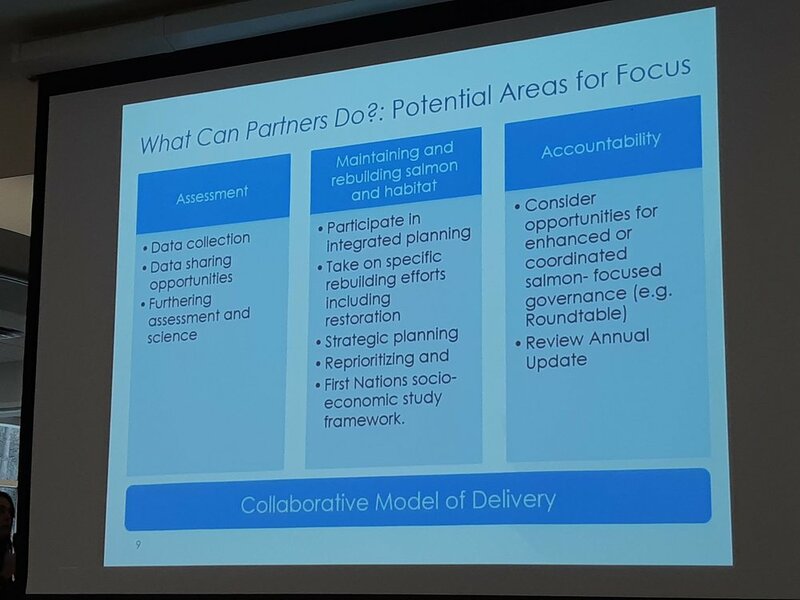 We'd like to thank the North Shore Streamkeepers for the invitation to the workshop, the 'Wild Salmon Policy Implementation Plan: From Policy to Action' held on February 23 in North Vancouver. Attending on behalf or HSWS was president Robbin Whachell and assistant hatchery manager Lani Lehun. 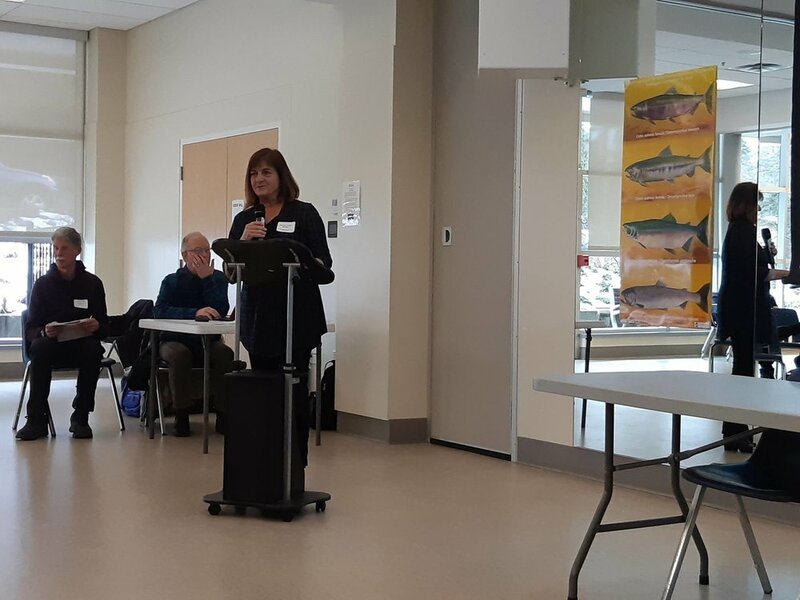 Opening remarks were given by the Minister of Fisheries and Oceans Canada Jonathan Wilkinson, with talks by ZoAnn Morten of the Pacific Streamkeepers Federation, and Sarah Murdoch of the DFO. An interesting panel discussion rounded off the afternoon with both speakers and fellow panelists David Patterson and Steve McDonald of the Pacific Science Enterprise Centre (DFO). Opening remarks by Jonathan Wilkinson MP Minister for Fisheries and Oceans and Canadian Coast Guard. A talk by Sarah Murdoch (DFO). Hatchery manager Rodney Lee demos the adipose fin-clipping procedure as Tyler Thibault of the DFO looks on (center). Close to 6000 coho salmon had their adipose fin clipped as part of a Department of Fisheries Canada encouraged exercise at Hoy Creek Hatchery in Coquitlam on June 20. The salmon are approximately 6 months old. The adipose fin is a soft, fleshy fin found on the top of the salmon, on the back behind the dorsal fin and just forward of the caudal fin. Clipped fish returns help DFO assess overall returns, helping to ensure the wild salmon are more dominant. 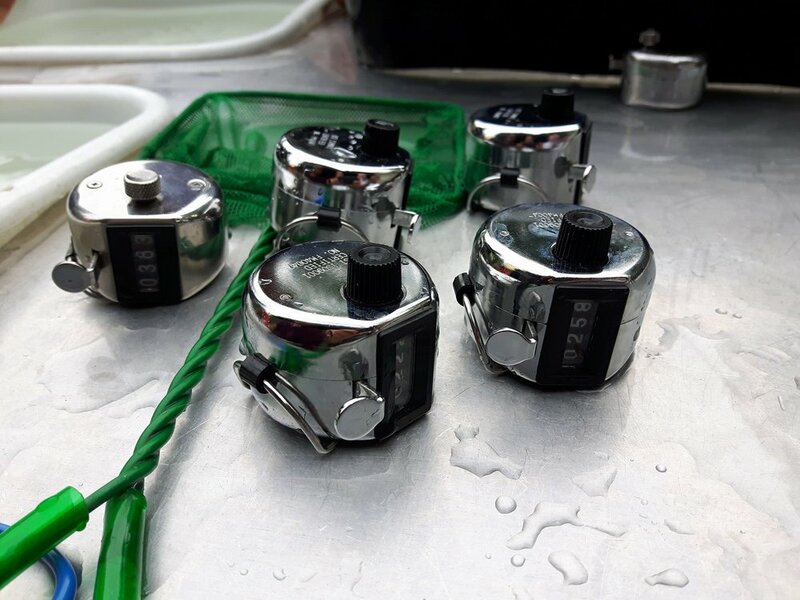 The procedure also allows for a manual fish count, whereas previously only weight sample counts took place. Everyone counts the fish they clip. Close to 6000 fish were processed. Overseen by DFO fisheries technician, Tyler Thibault, a group of about ten Hoy-Scott Watershed Society volunteers came out to help in the operation. Hatchery manager, Rodney Lee explained the procedure to a few people who were clipping their first time. First, the fish are anesthetized in small batches. Once in the solution, they become sleepy within minutes. The volunteers stand ready around a table equipped with a trough with flowing water and beds of water for the fish to lay in. Volunteers work quickly and very carefully to clip fins with disinfected surgical scissors before they wake up, which is within about a minute. Fish are put into the outside trough and end up in the bucket at the end of the table. They are returned to the hatchery to recover. The fish will soon be transferred from the hatchery Capilano trough room, and will live in the rearing pond until Salmon Leave Home in May 2019. Once they are released, they stay about a year in the stream making their way to the ocean. Fish from this brood could then return in about 2.5 years. Thanks to all those who helped out this year! Hoy Creek was teaming with chum salmon during the annual signature event for both Hoy-Scott Watershed Society and the City of Coquitlam, as residents of the tri-cities came out to enjoy a day in nature and learn from many local environmental groups at the Salmon Come Home festival. The rain held off and children and adults were delighted to witness the jumping and spawning salmon traveling up the creek. Opening words were offered by special guests, Kwikwetlem First Nation Councillor Ed Hall, and Elder Beverley Mrockowski. Also providing words of welcome was Coquitlam mayor Richard Stewart. Society volunteers held several live salmon demonstrations where Department of Fisheries community advisor for Lower Fraser Salmon Enhancement Program, Maurice Coulter-Boisvert, offered commentary and answered questions. Salmon educator and founding HSWS member, Chris Hamming kept children active and busy by the rearing pond learning about the salmon and its life cycle. Angela Brown and her nylon circus was enjoyed by little ones as they dressed up their parents and paraded through the festival grounds. The Creative Café and guest artists, Elaina Buenaventura, Etienne Siew, and Alana Crockett provided continuous musical entertainment and Spirit Bear Coffee was served. Hosted by the Hoy-Scott Watershed Society, and the City of Coquitlam who had their Bad Seed/Urban Forestry; Park Spark; Solid Waste and Recycling; and Water Conservation Departments out, other exhibitors included: Articipation; BC Salmon Marketing Council; Burke Mountain Naturalists; Coexisting with Coyotes; Coquitlam River Watershed Roundtable; Coquitlam Riverwatch; Fisheries and Oceans Canada; Freshwater Fisheries Society of BC; Kintec; Maple Creek Streamkeepers; and Port Moody Ecological Society. VIEW MORE Photos on our Facebook album HERE. Enjoy a video overview BELOW of the day's activates courtesy of the Tri-Cities Community TV. On June 21st, 2016 the Hoy-Scott Watershed Society conducted another successful fin-clipping exercise with over 6000 young coho salmon which had been thriving in the Capilano trough room of the hatchery located on Hoy Creek since approximately December 2015. "This was our third year of doing the fin clip exercise to identify our fish as 'hatchery' salmon," said hatchery manager, Rodney Lee. The fish are first sedated, and then the adipose-fin (small top back fin) is carefully snipped off. The entire operation is overseen by the Department of Fisheries. "We clipped over 6000 fry in two hours thanks to our volunteers," said Rodney. "The fish recover quickly and will be moved to our rearing pond in a few days, where they will live until their release next May. They will then head out to the ocean, and when they return, this is our way of identifying them." View our entire PHOTO ALBUM on Facebook HERE. Under the supervision of the Department of Fisheries, Hoy Creek Hatchery held another successful fin-clip exercise of over 6000 coho on June 21st.